The JBL Pro SoundBar PSB-1 is a cost-effective, commercial-grade active soundbar designed specifically for use in applications such as hotel guestrooms and cruise ship staterooms. With an optimized feature set targeting the unique requirements of these applications, the Pro SoundBar reduces the cost and complexity found in consumer-grade soundbars while providing excellent sound quality, security, and reliability. The all-in-one design of the Pro SoundBar provides full-range sound without the need for a separate subwoofer, providing excellent quality audio while minimizing sound transfer to neighboring rooms. For further volume management, the Pro SoundBar offers a 4-position volume limiting switch to control the maximum volume output of the soundbar. The Pro SoundBar supports both fixed and variable source volume for maximum TV compatibility. Controls for the volume switch and source volume selection can be covered by a lockout plate to prevent tampering by anyone other than the support staff. Better clarity at low levels allows users to hear without increasing volume to intrusive levels. Front-facing speakers offer improved clarity over internal television speakers. TV speakers are typically rear or downward facing, diminishing the quality and volume and increasing sound transference. No cloth is used on the speaker grill, making the product easier to clean and maintain and less prone to damage. 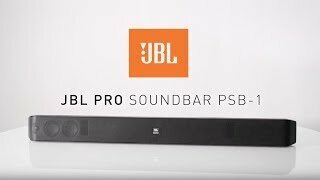 The JBL Pro SoundBar is compatible with both fixed volume and variable volume control schemes. Whether the volume is controlled directly at the soundbar or upstream at the TV, the Pro SoundBar is able to support these scenarios, with a single remote controlling the entire system. This is made possible by the Pro SoundBar’s IR Learning feature. In fixed volume scenarios, where the volume is controlled at the soundbar, the Pro SoundBar is able to “learn” the IR pulse of volume up and volume down controls, meaning any remote can be used—programmable or not. This allows guests to use a television remote to adjust the entire system without the need to use a smart remote. No matter the system requirements, the JBL Pro SoundBar offers users a simplified experience. Mounting/Installation Two included brackets, desk/table or on-wall mounting. See Owner’s Manual for installation diagrams. Dimensions (H x W x D) 90 x 900 x 65mm (3.54 x 35.4 x 2.55 in). See Owner’s Manual for dimensional drawing.